Police believe that a man who has been robbing high-end clothing boutiques at knifepoint struck again in Lincoln Park this afternoon. 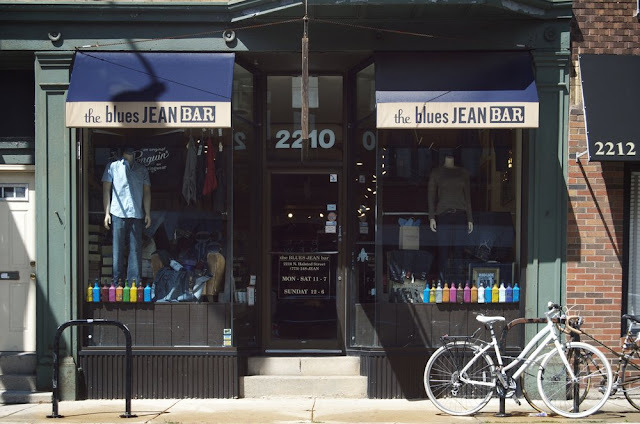 According to witnesses, a man armed with a kitchen knife entered the The Blues Jean Bar at 2210 N. Halsted around 2:45PM and demanded money. After getting about $150 from the till and cash from an employee's purse, the offender fled in an unknown direction. Blues Jean Bar is located a half-block from the Londo Mondo store that was robbed at knifepoint on May 13. Another store in Wicker Park was also targeted by the same man, according to a Chicago Police Department alert. Last week, $6,000 worth of purses were stolen by three men who cleared merchandise from the shelves of eDrop-Off Luxury Consignment, 2117 N. Halsted. The eDrop-Off case is not immediately believed to be connected to the knifepoint robbery cases. The offender today was described as a black man in his late 20's who was wearing a black hoodie and dark jeans. He stands about 5'7' tall, weighs about 150 pounds, and has a medium to dark complexion. While no vehicle getaway vehicle was immediately today, police believe the knife-wielding robber uses a "very clean" 4-door maroon Oldsmobile Intrigue or Alero.